A documentary is being made in this year. Pockets of Hope is the story of how and where Fay's music has taken her. This part of the journey takes her to Poland, where she was born shortly after the war. Fay applies her gift of music to the Jewish concept of Tikkun Olam, which means 'repair or heal the world'. She works tirelessly in inter-cultural work to connect people and teach them acceptance of each other. Her fervent wish is to sow seeds which lead to forgiveness and to healing the hearts and souls of the youth in Poland, who carry with them the pain of generations past. Fay Sussman has had a dream, most of her adult life. The dream is to repair the relationship between the Polish people, and her Jewish heritage. Both share history in the great tragedy of the Holocaust. As the principal singer of the Klezmer Divas, Fay has been invited with the band to sing in Poland in June 2013 at a number of Festivals. In addition, they will return to some of the small former Jewish towns, known as shetls where all evidence of Jewish life was obliterated. Recently, a brave group of young Poles have sought to re-establish the Jewish Heritage of the towns, against opposition. The greatest symbol of this movement and reconciliation is the History of Polish Jews Museum, which is about to open in 2013 on the site of the famous Warsaw Ghetto uprising. Fay has been invited to be one of the first singers to perform there. This journey is named Pockets of Hope. It is a film about music and healing. Facing up to a difficult past and creating a hopeful future. The film deals with the hostilities of the past and set a path to move forward, by way of the universal language of music. In this instance, Klezmer and Yiddish music was very much part of the rich fabric of Jewish Culture in Poland before the war, Fay's dream is to return and seek to heal and reconnect young Polish people to this rich culture that is both Polish and Jewish and has been absent from Poland since the war. May her dream be realised and bring healing and peace to to those in Poland who support these efforts. Fay's journey really started hundreds of years ago when her paternal ancestor, a Cantor left Spain during the time of the Inquisition. Fay, inherited a lovely singing voice and was born into a Jewish family who loved and lived to sing. Born just after the war, to Sema (from Odessa) and Avraham Punim (from Poland), both Holocaust Survivors, her late father imbued in Fay, a deep and abiding love of her people, their language and music. She was a tiny child when he taught her to sing in Yiddish, while his mother Adella taught her to sing in Polish. Avraham's dream was that she would carry the tradition of music and Yiddish into the future. It was the only way he knew, to honour the past and keep the candle burning well into the future. Not only does Fay recall her childhood with happiness, despite the desperate times in which she was born and raised, but she has expanded Avraham's dream and built it into her own. While he wished to have her sing only for her own people, Fay brings the joy of music to promote inter-faith and inter-cultural work. Produce a number of interfaith musical events bringing people from diverse communities to perform together. Including Uniting the Voices of the Middle East, as lived in Israel for 10 years before coming to Australia. Fay brought together musicians from Palestine, Israel, Lebanon, Iran, Syria, Egypt, Turkey and many more. Produce and Direct The Interfaith Music Festival for the Pre Parliament of World Religions festival in Sydney. Performing for the German Film Festival in Sydney by the Goethe Institute to sing in Yiddish. Being Polish born, her family has a long standing history in Poland from, Galicia, Lemberg, and Levov (now the Ukraine). Though qualified to be a guide at the Sydney Jewish Museum, Fay believes her path is through music. A focal point of her work, has been to bring the Polish and Jewish Communities together to commence healing the large rift between the communities that has existed since the Holocaust. Fay strongly believes that the children and grandchildren from both sides carry much of the pain of the past and would like to be free of it to forge happier healthier lives. She believes her actions set an example to a new generation of Jews and Poles. One of her productions included a musical interfaith event at a Jewish synagogue, the Emanuel Synagogue, for Catholic Youth Week. Here traditional Polish Dancers were invited to perform. The then Polish Consul, Ryszard Sarkovich, attended and an invitation was sent to the Pope. A letter from the Pope was received tendering thanks and his gratitude for the good will. It was read at the concert. This was the first collaborative performance which included Polish, Croation, Bosnian, Russian, German, Serbian, Aboriginal, Czech, Slovak, Macedonian and Jewish Communities. On another occasion, Fay sang at the Polish Embassy when Halina Robinson's book, Cork on the Waves, was launched in Canberra. 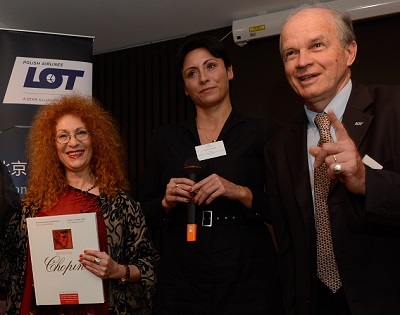 This was the first time the Israeli and Polish embassies united for an event in Australia. The Polish Press described Fay as the 'Yiddish Piaf'. Fay sings in St. Mary's Cathedral for the Annual Holocaust Memorial Service organised by the Council of Christians and Jews, and for the Kristallnacht, 'Night of Broken Glass' Memorial Service in Martin Place organised by the Council of Christians and Jews NSW Inc. In addition Fay is an active member and Guide with Courage to Care – a travelling Human Rights Exhibition that brings true life changing stories of hope to school children, and is an effective anti-bullying program which tours Australia. Fay believes that the youth of today are the leaders of tomorrow and works diligently to empower children with hope and love to work towards a world free of war and hatred. The Courage to Care organisation builds bridges between communities by recounting and focusing on the goodness and kindness of people of all faiths cultures and creeds, who stepped out of their comfort zones to save lives, and there are many of them to be remembered. Theirs remains eternally, a shining example for us all. If you wish to know more about the documentary being created called Pockets of Hope, go to the Pockets of Hope Movie web site. A 100% tax deductible contribution can be made through the Australian Documentary Foundation, by clicking on this link. Fay's Journey is a feature documentary film which follows Fay Sussman a well known Klezmer singer and Human Rights activist back to her native Poland to make peace with the past by performing Yiddish and Klezmer Music in small Polish Shtetls where Jewish Culture is being welcomed after all memory of this culture being wiped out post-Holocaust. We meet 3rd Generation Poles who are curious about the Jewish roots in their towns and have formed groups to restore long neglected Jewish Cemetaries. The film will capture the historic return of Yiddish Music to these towns and plant the seeds of a new future of co-operation and understanding between Jews and Poles. By having Music as the vehicle for this new understanding Fay’s Journey will cover the history of the past and remind us of the rich history of Jews in Poland and the great legacy they left behind. Stage 1 in June 2013 is for historical purposes with a desire, funding permitting, to produce into a documentary film.